This can represent a dimensionless quantity, such as energy for instance. In the class definition (here) I have used the variable 'e' to represent the scalar part of the multivector. A 3D vector can represent a direction element such as a point in 3d space relative to the origin of the coordinate system or say, a movement within the coordinate system. These basis don't have to be mutually perpendicular (although for the practical applications of this program they probably will be) however they do have to be independent of each other, in other words they should not be parallel to each other and all 3 should not be in the same plane. In the class definition (here) I have used the variables 'e1', 'e2' and 'e3' to represent the vector value of the multivector. This can represent a plane element or area element. As shown here a plane can also represent a direction of rotation in 3D. 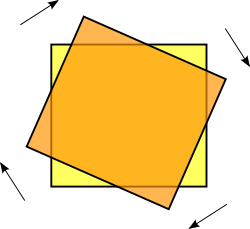 So in 3 dimensions there are 3 BiVectors for any gives set of bases, represented by the 3 possible pairings of the bases. Each of these BiVectors, for example e1 ^ e2, represents the area in the plane of these vectors. This area will be maximum when A and B are at 90 degrees (right angles) to each other and zero when the vectors are along the same line (not allowed for basis vectors). Note also that this area is signed, that is, it may be negative. It will be reversed if the order is changed e1 ^ e2 = -e2 ^ e1. These 3 BiVectors are not vectors, but they can be represented by a vector, by finding a vector which is mutually perpendicular to the 2 vectors which make up the BiVector. This is the same as the 'x' cross product since we are working in 3D here. In the diagram above I have shown an equivalent direction being found by left or right hand rule. The first finger gives the direction of the vector before the ^, the second finger gives the direction of the vector after the ^, the thumb will then give the direction of the equivalent vector. However, this may be positive or negative as explained above, so we may need to invert the direction depending on the order of the operands. In his book, David Hestines associates bivectors with a rotation as shown above, because the order is A^B this gives a clockwise rotation on the diagram. Using this rotation concept it is much easier to explain how a bivector can be negative than only describing it as an area. So can we use this to choose the order of bases in the bivectors? If, using the left hand, we curl the fingers in the direction of the rotation then, the thumb seems to point in the direction of the other vector (at least in the way I've drawn it here). Can anyone think of a way that this idea could be generalised? In the class definition (here) I have used the variables 'exy', 'ezx' and 'eyz' to represent the bivector value of the multivector. The TriVector is very similar to the determinant of a 3x3 matrix made up of the three vectors a,b and c as described here. Discussion about planes in 'n' dimentional space. Discussion about projections on planes. 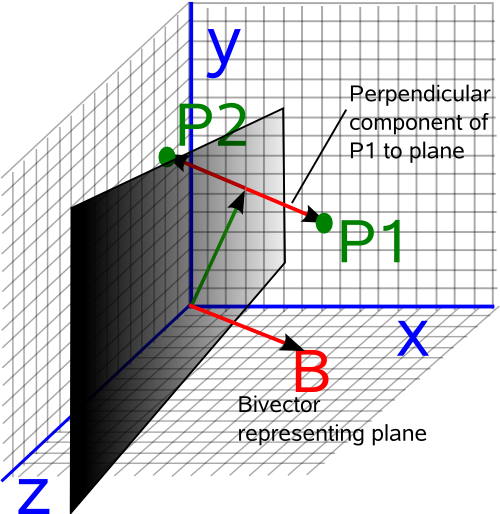 B = bivector representing the plane. Since, in this case, K is a bivector then we will denote it by B and set k=2. Discussion of this in 3D using quaternions. In other words the parallel component plus the perpendicular component is the point itself. 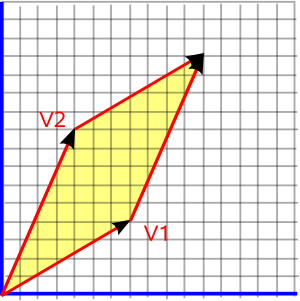 The component of the point, in 2D, that is parallel to the line. The component of the point, in 2D, that is perpendicular to the line. A mapping from the 2D point to one dimensional space represented by the line. 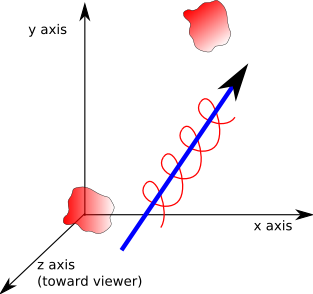 A mapping from the one dimensional distance along the line to the position in 2 space. These transformations are related as we will discuss. We can extend these ideas to 3 space or 'n' dimensional space. 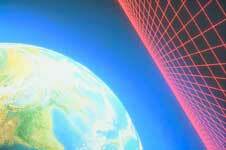 We can then extend to projections onto planes, hyper-volumes, and so on. A directed area has both quantity and direction. The quantity represents an area and the direction represents the plane that the area is in. This quantity is similar to a vector, but has slightly different properties and is called a bivector. A discussion of directed areas using vectors is on this page. A discussion of directed areas using clifford algebras is on this page. Planes, surfaces and areas are discussed on this page. We can represent any movement of a solid body by a single operation which combines both the rotation and the translation. This page explains this. Using Motor Theory based on Clifford Algebra. Geometric Algebra for Computer Science: An Object-oriented Approach to Geometry. This book stresses the Geometry in Geometric Algebra, although it is still very mathematically orientated. Programmers using this book will need to have a lot of mathematical knowledge. Its good to have a Geometric Algebra book aimed at computer scientists rather than physicists. There is more information about this book here.